This Fresh Peach Salad is topped with grilled basil chicken and a sweet and tangy white balsamic vinaigrette. This grilled chicken salad can be served as a side dish or an entree and is the perfect way to use up end-of-summer peaches! While there’s still about a month left of summer, it really is just starting to feel like it’s over. We had our last beach day today, so basically that’s my goodbye to summer. One thing I love about the end of every summer is the abundance of fresh peaches everywhere. I had two neighbors bring me a bag full of them and I also had bought a bunch of local ones at the store. So we have been eating peaches in everything and drinking them in just about every smoothie for the last two weeks. And no one is complaining about that around here, we all absolutely love peaches! Who could resist them? They’re sweet, juicy and perfectly tender. I just love biting into a freshly picked peach. The other thing I love (and if you’ve been reading for a while I’m sure you’ve caught on by now) is grilled chicken salads. They are so versatile and you can add just about anything to them, and if we are going to go all out on a salad we may as well make it into a meal, right? 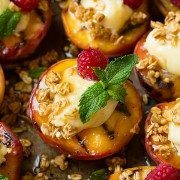 Since it’s peach season of course I had to do a peach salad recipe, and this one does not disappoint! I can almost guarantee that, like me, you’ll love everything about this peach and basil chicken salad! From the chicken marinated and infused with fresh garlic-basil flavor, to the combination of fresh peaches, corn and goat cheese and of course how well it is all complemented by the white balsamic vinaigrette. I could pretty much live on this peach salad! It might just become one of your favorite summer salads, just be sure to try it before summer is over! Marinate chicken for 2 to 5 hours, then grill over medium-high heat. Slice grilled basil chicken and set aside. Whisk together white balsamic vinaigrette ingredients in measuring cup. Prep veggies for the peach salad, then add to large bowl. Drizzle dressing over top and toss to combine, then top with grilled chicken. Can I Use Canned Peaches in This Salad? I wouldn’t use canned peaches in this grilled chicken salad. They contain a lot more liquid and are typically far sweeter than fresh peaches. Can I Use Regular Balsamic Vinegar Instead of White? Yes, but know that regular balsamic vinegar is much stronger than white balsamic vinegar. So you may need to add a little more honey to the vinaigrette to balance out the flavors. I wouldn’t recommend substituting dried basil for the fresh. But as a last resort if it’s winter, I would use 1 tablespoon dried basil. Even though the general rule is to use 1/3 the amount of fresh, I think that would be far too much here. Let the grilled basil chicken rest on a cutting board for 10 minutes before slicing it. This gives the juices time to redistribute and makes for a moister slice of chicken. Feel free to play around with the ingredients in this salad — use a different lettuce blend, soft cheese, etc. This delicious peach and basil chicken salad is likely to become a new summer favorite! It's filled with tender lettuce blend, sweet juicy peaches, herbed grilled chicken, fresh corn, creamy goat cheese, crunchy pecans and finished with a tangy balsamic dressing. So much goodness! In a small mixing bowl whisk together olive oil, basil, garlic, and lemon juice and season with salt and pepper (about 1/2 tsp of each). Using the back of a spoon, press basil against sides and bottom of bowl (to help extract flavor from basil). Place chicken in a resealable bag and pound thicker parts of chicken to even thickness with a meat mallet, then pour basil mixture over chicken and evenly distribute basil over chicken. Seal bag while pressing excess air out, rub marinade over chicken and transfer to refrigerator and marinate 2 - 5 hours. Preheat a grill to 425 - 450 degrees over medium high heat. Brush grill grates lightly with olive oil then place chicken on grill. Grill until cooked through, rotating once halfway through cooking, about 4 - 5 minutes per side (chicken should register 165 degrees in center of chicken on an instant read thermometer). Transfer to a cutting board and let rest 10 minutes then slice into strips or dice into cubes. Whisk together all ingredients until well blended and season with salt and pepper to taste. Store in refrigerator until ready to use, stir again before pouring over salad. In a large salad bowl gently toss together lettuce, peaches, corn, pecans, onions, and grilled chicken. Sprinkle goat cheese over top and drizzle with vinaigrette. Serve immediately after adding dressing. I wouldn't recommend substituting dried basil for the fresh. But as a last resort if it's winter, I would use 1 tablespoon dried basil. Even though the general rule is to use 1/3 the amount of fresh, I think that would be far too much here. 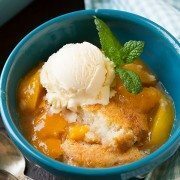 Kimberley: Had this for supper last night and it was soooo good! My hubby wasn’t too thrilled we were having salad as the main course but he ended up enjoying it! I couldn’t find white balsamic anywhere so used dark and it still tasted wonderful. Shirley s.: I made this today and we really enjoyed it.